Philanthropy Northwest’s Democracy Lens is a tool to help grantmakers recognize their capacities to create a more vibrant democracy in their states and communities. Using the project's case studies and data, democracy-focused funders can refine their strategy goals, and other funders can identify aspects of their work that involve the strengthening of democracy. With a wider understanding of the issues, grantmakers can address dissatisfaction in public institutions by reinvigorating communities' self-determination and engagement in policy. The Democracy Lens highlights how philanthropy can enhance public discourse, civic participation and effective citizenship, as well as revealing places for improvement by exploring examples of democracy-building initiatives. The Democracy Lens’ Bright Spots examine successful democracy-improving initiatives in the Northwest. Alongside the broader context of democracy efforts across each state in our region, each case study illustrates a change made to address a governing problem, the impact of that change and philanthropy’s role in the implementation. These solutions to civic participation issues have inspired other communities to replicate their success and experiment with their own democracy retooling efforts. The Bright Spots will be an ongoing collection of examples from across our region. Data provide a window into the health of democracy in the Northwest. Statistics include the political representation of women and people of color, foundation funding toward direct and indirect outcomes that build democracy, the number of nonprofit local media sources, and voter turnout and registration rates. Combined with the Bright Spots, the data paint a clearer picture of where funders can address shortcomings in the democratic processes of the region. *All grants are at least $5,000 from foundations making at least $15,000 in aggregate contributions. 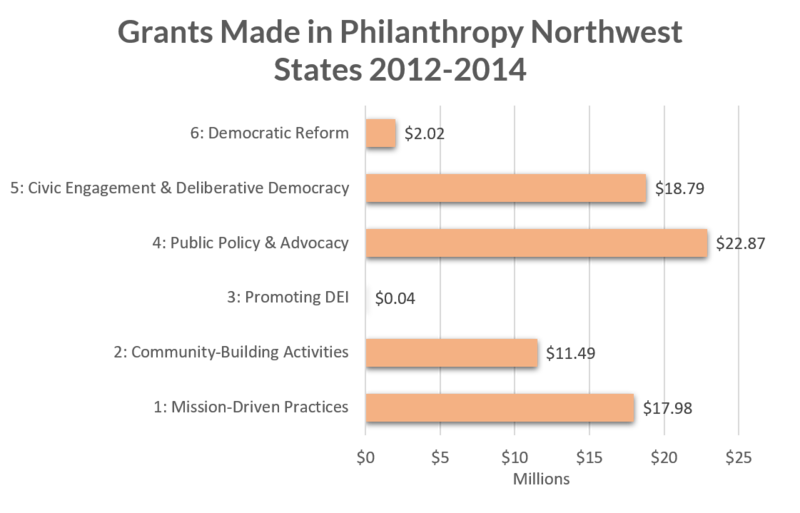 Philanthropy Northwest evaluated the democracy-building grants in the Northwest in 2012, 2013 and 2014, scored them along a spectrum of intentionality to strengthen democracy, and assessed how the funding was distributed across the categories on the spectrum. The Rasmuson Foundation granted $25,000 to Anchorage Botanical Garden to support broadband internet infrastructure in Anchorage, AK. The John S. and James L. Knight Foundation granted $62,000 to Wyoming Community Foundation to add staff and expand coverage in the statewide independent news service, WyoFile. Meyer Memorial Trust granted $175,000 to McKenzie River Gathering Foundation to build the organization's capacity to support community-based organizations in Oregon working to achieve social justice. Northwest Area Foundation granted $100,000 to Jannus, Inc., for the Idaho Center for Fiscal Policy. The Bullitt Foundation granted $45,000 for coordination of Montana's Conservation Working Group and non-partisan voter registration, voter education and get-out-the-vote activities. The Oregon Community Foundation granted $5,000 to Healthy Democracy for general support of a multi-phase effort to evaluate the viability of a campaign to reform campaign finance laws in the state of Oregon, convene stakeholders and strategize a campaign for reform. Utilizing data from the Democracy Lens, funders can identify the strengths and areas for improvement in advancing democracy their own communities. From 2012 to 2014, about one percent of foundation grants to the Northwest focused on a democracy-related cause. In that same timespan, only around three percent of democracy-focused grants in the Northwest aimed to directly improve democratic processes, leaving a significant opportunity for expansion. With the Bright Spots as a starting place for identifying creative avenues for philanthropic involvement, funders can glean insights into political process issues faced by Northwest communities, plus potential solutions that require their leadership. The role of government in assisting eligible voters to register has changed over time and varies significantly by state. In general, the onus falls on the individual to seek out a voter registration form, complete it and return it to the local election administration agency. In 1993, Congress passed the National Voter Registration Act (NVRA), commonly called “motor voter.” The Act requires states to provide individuals with the opportunity to “opt in” and register when applying for or renewing a driver’s license or seeking public assistance. At the state level, legislatures have passed a variety of measures to ease the burden of voter registration, including through online voter registration (38 states), same-day registration (eight states) and pre-registration for 16- and 17-year-olds (16 states). What is the most appropriate role for the government in registering those eligible to vote? A recent reform campaign in Alaska shows how a state government can build upon existing infrastructure to add more voters to the rolls. The experience in Alaska was different from the others on several levels. First, while legislators enacted AVR elsewhere, in Alaska, it was the voters that passed a citizen initiative in November 2016. Further, the registration process is not built off the process of obtaining driver’s licenses, but rather on the state's Permanent Fund Dividend, which distributes oil revenues to residents. When residents apply for their annual dividends from the Permanent Fund, their information is automatically transmitted to their local election office. This method ensures that the voter rolls are updated annually with the most accurate information. Advocates chose this route for AVR because more Alaskans apply for the Permanent Fund than a driver's license, particularly in rural communities and among the Native population. People of color and tribal communities in Alaska have traditionally had problems with access to the polls, being largely underrepresented in voter rolls. In previous election cycles, Alaska Natives accounted for 15 percent of the state’s population, but only comprised seven percent of registered voters. There was no formal organized opposition to the AVR ballot initiative in Alaska. Members of both parties, as well as influential businesses, including BP, were supportive. The main criticisms were of the cost of AVR, estimated by the state to be nearly $1 million in the first year, with additional annual costs of approximately $300,000. Within a year after Oregon initiated the first AVR policy in 2015, voter registration increased by more than 10 percent, or 250,000 residents. Further, a Demos study found that people of color and younger people disproportionately registered through AVR and that the reform led to a two- to three-percent increase in voter turnout overall. An analysis of total registered voters in Alaska shows a modest increase over a similar timespan in 2015, with a significant spike (7,272 additional voters) in January 2018. Funders can support voter registration through various means, including nonpartisan education and outreach as well as funding the non-lobbying portion of ballot measure campaigns. In Alaska, the AVR campaign included contributions from the Cook Inlet Region, Inc. and the Bristol Bay Native Corporation. Philanthropy has played an important role in helping people register to vote. In the 1980s, a small group of foundation leaders formed the Ad Hoc Funders’ Committee for Voter Registration and Education, which later became the Funders’ Committee for Civic Participation, a membership organization of philanthropies that focuses on democratic reforms. Many funders supported voter registration drives led by groups like ACORN (Association of Community Organizations for Reform Now) and essentially compensated organizations based on volume of completed forms. More recently, foundations have shifted to supporting policy reforms on voter registration to emphasize the responsibility of state and local government to register new voters. Foundations such as the Bauman Foundation, an organization that awards $6 million in grants per year toward advancing democracy and social change, have funded the Center for Secure and Modern Elections. This entity provides advocacy support to local and state election reform efforts. Actions by foundations in registering voters in years past, seen as having the intent to remove specific elected officials, ultimately led Congress to institute strict guidelines on how foundations could be involved in the registration process. These include limitations on how a foundation spends on programming, where it receives support and measures to ensure that a foundation’s voter registration efforts are nonpartisan and widespread – not based on a single local election. Despite the restrictions, there are ways in which foundations may support voter registration efforts, such as by launching nonpartisan voter education outreach or giving grants to charities involved in ballot measure campaigns. Automatic voter registration can reach more of the population, especially underrepresented groups, if tied to the state's most common type of application. Higher voter registration has yielded increased participation in the following election. Philanthropy has shifted from funding efforts to register voters to funding advocacy efforts to help governments increase their voter turnout for broader systemic impact. Ideological division affects our public life here in the West as it does in the rest of the country, in part because of the prevalence of public lands in the region and the layers of regulation and bureaucracy that accompany them. In more recent times, a very different approach to western issues has taken root and spread to many quarters in the region. Conservationists, hunters and anglers, farmers and ranchers, loggers and even miners, who had often spent decades at odds over public land and natural resource issues, have increasingly found common ground that they would never have imagined they might occupy together. The reason this matters so much is because democracy, at its very core, is about people solving problems together. Jan Brown ran a guest lodge in southeastern Idaho, on a blue-ribbon trout stream near Yellowstone Park. Her livelihood depended on the fact that there were big trout in the Henry’s Fork of the Snake River, and that her guests liked to catch them. But the river was threatened from many directions. Cattle grazed near it, wearing down the banks under which the big fish liked to slip. State fish and game managers allowed more fish to be caught than the population could ultimately sustain. Henry’s Fork Foundation (HFF), a conservation nonprofit, protects the Henry’s Fork of the Snake River. The group’s aggressive advocacy had brought it into direct conflict with area ranchers, as it sought to remove cattle from the public lands abutting the river, where the ranchers had grown accustomed to leasing the public land. This was the environment into which Jan Brown stepped when HFF hired her as its executive director in 1991. Brown’s presence in public hearings was met with hostility from farmers, as well as executive director Dale Swensen of the irrigation district. But Brown and Swensen eventually agreed to search for common ground by co-chairing a new group, the Henry’s Fork Watershed Council (HFWC). The Idaho state legislature created the HFWC in 1994 as a response to pressure from Henry’s Fork citizens, as well as a lack of cohesion regarding which government authority ran the Henry’s Fork Basin, where over two dozen agencies claimed some authority. Government mismanagement had led to two manmade ecological disasters in 1992 that temporarily contaminated the water and ruined the fish supply. From then on, all perspectives would be heard before making contentious decisions again, so the council was made up of citizens, technical analysts and government agency representatives, who would review government plans surrounding the basin and make recommendations. The HFWC would not only serve as an open educational forum, but also work with agencies across multiple jurisdictions. The organization has no formal power, but it has become a trusted resource on watershed issues for everyone that has a stake. From those tentative beginnings, the watershed council met regularly for two decades until it was no longer really necessary. During that time, the HFWC had steadily and persistently brought together all the competing interests in the watershed – farmers, ranchers, anglers, outfitters and guides, environmentalists – providing a forum where they could address whatever new challenges might arise on the Henry’s Fork, abiding by the maxim that “none of us are as smart as all of us.” This collaboration has helped the HWFC take a leading role on projects such as a stream restoration effort, weed control project and road improvements around the area. Today, the HFWC remains a platform for citizens and advocacy groups to share insights, such as seasonal climate predictions and updates on projects. The Council does not handle massive projects or those not relating to the watershed, but usually finds agreement to push forward on smaller improvement efforts. Dozens of watershed councils and other landscape-scale, cross-ideological collaborative efforts have sprung up around the region in recent decades, including in Oregon and Montana. The Central Idaho Rangelands Network is a group of conservationists and farmers dedicated to utilizing and spreading better land and water protection practices in the Upper Salmon River, Lost Rivers and Pioneer Mountains region of central Idaho. One of the entities that has supported the Rangelands Network is the Brainerd Foundation, which was also an early supporter of the Henry’s Fork Foundation during Jan Brown’s leadership. Brainerd’s investment in these organizations was primarily in support of their advocacy activities. That has been the case in many of these instances of collaboration, when a strong advocacy organization begins to search for common ground with the “other side.” Foundations, like Brainerd, that have trusted their creative grantees and supported them as they proceed to solve real problems and devise solutions that no amount of advocacy could have produced – those philanthropies have contributed to democracy in a way that, while perhaps unintended, may outlast any more traditional investment they could have made. Citizen-run forums can alleviate division within communities, encourage civic participation on local projects, and be a useful resource for government agencies working in the area. Active involvement in and support of local land and water use councils, which have become common in the Northwest due to the prevalence of public lands, can foster democratic collaboration. We are now so accustomed to this feature of American life that we are likely to take it for granted, and to overlook the role it still plays in keeping our democracy viable. When we think about the weaknesses and wounds that afflict our body politic, we think (for good reason) about the excessive role of money or of partisanship in our political and governing institutions. When we try to imagine how we might heal our democracy, we are more likely to think about increasing voter turnout, recruiting better candidates or improving our advocacy skills long before we think about strengthening the nonprofit sector in general. In fact, though, Tocqueville’s incisive observations about the democratic role of this part of our society is as relevant as ever, and maybe even more so, given the challenges our democracy now faces. If this is true, then there are two further implications important to highlight. The first is that the philanthropic sector has a crucial role to play, since philanthropy in all forms – from individual charitable contributions to the largest of foundations – must continue to provide the resources that enable nonprofit organizations to play this or any other role in our society. The second observation, to be examined first, is that this kind of philanthropic support has already made Montana a bright spot on the map. In 2016, Andrew Littlefield undertook some research for the nonprofit service network “WeDidIt” to determine which states had the highest number of nonprofit organizations per capita. Littlefield found that Vermont led the list, with one NGO for every 160 residents of the state – twice the national average of one nonprofit for every 320 Americans. Second on the list, though, was Montana, with one nonprofit for every 207 residents. The Northwest made a very strong showing overall, with Wyoming in fifth place, Alaska in seventh and Oregon thirteenth. What if all these organizations – or any number of them, taking account of their democratic potency – were simply to ask themselves what concrete steps they might take, separately or together, to help heal or strengthen the Montana body politic of which they already constitute a very substantial element? If Montana is already a bright spot in terms of nonprofit vitality, why not leverage this strength to help revitalize our democracy? The creation, care and nurture of nonprofit associations is vital to democracy. Democracy is fundamentally about the people determining among themselves the basic conditions of their own lives. No matter what institutions we put in place, who we elect to office or what policies they adopt, if most people do not have a sense of their own capacity to make a difference, democracy in that core sense simply cannot thrive. That is precisely why Tocqueville made the connection between Americans’ passion for association and their capacity for democracy. It is still as true today as it was in his era that the experience of people within their chosen organizations is crucial to their sense of agency. This is true for the simple reason that every one of those organizations pursues a mission, and the people who staff and govern those nonprofits become over time extremely skilled at exploiting every opportunity to realize that mission. In other words, they become skilled at democracy. These citizens also work hard to elect the best people they can find to fill governing positions, but when they see so many of their larger political and governing institutions falling short of their individual standards of effectiveness, they naturally ask what more they can do than try to elect the best people to office. In particular, how can that Tocquevillean musculature of their associational activity be brought to bear on these larger problems of democracy? Let’s assume that it’s operating fairly well locally: can it be scaled up one order of magnitude to make a difference at a state level? If Montana is already a bright spot in these terms, how might that civic horsepower be brought to bear more effectively at larger scales? Supporting specific mission-driven work by grantees in almost any arena, from social services to conservation, can strengthen civil society and political culture by nurturing substantial problem-solving skills. Creating a strong nonprofit network contributes to the civic culture of a community or state, and this side-effect can be substantially leveraged by more deliberate investment in developing collaborative problem-solving and advocacy skills. Investing in statewide civic infrastructure like nonprofit associations, statewide leadership development or resources for civic dialogue can further enhance the democratic resource represented by a vibrant nonprofit sector. In the Northwest region, all states allow for citizen initiatives. Most of these states ratified their processes during the Progressive Era (1890-1920) as a reaction to unbridled corporate power and corrupt political machines. Information about proposed ballot initiatives, however, varies greatly by state. All provide information online with the full text of the initiative, though not all mail copies to all addresses, provide a full explanation, offer pro/con arguments or include a fiscal note. In 1998, voters in Washington passed I-200, an initiative to ban public affirmative action policies, by a wide margin. Advocates for retaining affirmative action complained that the ballot language was confusing. In addition to examples that confuse voters, the ballot initiative process is the preferred mechanism for well-funded narrow interests to circumvent the traditional legislative process. What is the role of the state in providing clear, unbiased information such that voters can make an informed decision about ballot initiatives? Further, how can voters meaningfully engage in the policy development process to craft good proposals for the electorate to consider? The Citizen Initiative Review process in Oregon provides an innovative example of voter education and citizen engagement. In 2011, the Oregon Legislature established the Citizens' Initiative Review Commission to oversee the Citizen Initiative Review (CIR) process. In a CIR, organizers select a panel, made up of a random sample of two dozen voters who are demographically and politically diverse. The panelists meet for up to five days to learn and deliberate about a ballot initiative that will be voted on in an upcoming election. During the CIR, panelists engage with advocates and stakeholders supporting and opposing the initiative, as well as neutral policy experts. The panelists deliberate to identify important facts about the initiative, decide whether to support or oppose the initiative, and identify reasons to justify their position. The deliberations are structured and led by a moderator, who ensures that each panelist’s voice and opinion are heard and considered. At the end of the CIR, the panelists write a Citizens’ Statement that sets out the facts about the initiative that they agree on, the number of panelists supporting and opposing the initiative, and the rationale. The Citizens’ Statement is then made available to the public and the media and included in the official voters’ guide. The goal of the CIR was to ensure that voters could receive independent, factual information about citizen initiatives that were on the ballot. According to researchers who looked into the CIR and reported their findings for the Democracy Fund, “one finding consistent between the 2010 and 2012 research reports was that reading the CIR Statement increased voters’ knowledge levels. The 2014 surveys replicated that finding, principally through a variety of survey experiments.” The Oregon CIR has been so successful that the process was largely adopted, with small alterations, by the State of Arizona. Oregon also received the International Association for Public Participation’s Award for North American Project of the Year and Project of the Year internationally in 2013. In 2003, Minnesota-based philanthropists Ned Crosby and Pat Benn wrote Healthy Democracy, which outlined ways to use deliberative democracy in the ballot initiative process. A prime motivation in the concept for CIR was to develop policy proposals through a randomly selected panel, as well as to review those advanced by interest groups. The couple traveled throughout Washington State in 2004 to promote the idea of CIR. With an early endorsement from the Association of Washington Cities, Crosby and Benn lobbied state legislators codify the concept. Though a bill was introduced in 2007, it languished in committee. Turning their attention to Oregon, Crosby and Benn teamed with two recent policy school graduates, Tyrone Reitman and Elliot Shuford, established and funded Healthy Democracy Oregon, the organization that would ultimately carry out the CIR process. After a trial in 2008, the State of Oregon authorized the CIR to examine and publish in the voters’ pamphlets examinations of two initiatives that would be on the 2010 ballot. The following year, the state legislature passed a measure making CIR an official part of the statewide initiative process. Supporting efforts that engage citizen input on ballot measures builds a more informed, trusting electorate. Philanthropy can play a catalytic role in promoting, testing and building innovating processes that increase civic engagement. The way candidates raise campaign funds has impacted who wins elections and how they govern. Wealthy interests are investing larger sums of money in politics to alter politicians’ policy views in favor of those who fund their campaigns, as opposed to promoting accountability with the general public. Much of the campaign finance regulatory system was established by the Federal Election Campaign Act of 1971 and, based on the public outcry from the Watergate scandal, subsequent amendments in 1974. A key aspect of this legislation was a limit on campaign expenditures by candidates, political parties and political action committees (PACs). Two United States senators challenged the provision in court, and in 1976, the Supreme Court of the United States ruled in Buckley v. Valeo that such a restriction constitutionally infringed on the First Amendment right to free speech. Since this landmark decision, many campaign finance advocates have focused on advancing publicly financed campaigns as a different way to limit the influence of money in politics. There a few general models for such systems, two of which have been implemented in the Northwest. Seattle, WA. From 1979 to 1991, the City of Seattle matched the first $50 of contributions to municipal races from residents in the city, as long as the candidates abided by certain expenditure limits. In 1992, Washington voters approved I-134, halting Seattle’s program by barring political campaigns from using public funds. The state legislature repealed the ban in 2008. Portland, OR. In 2005, the City of Portland adopted its first publicly financed campaign system called “Voter-Owned Elections.” Participating candidates had to raise between 1,000 and 1,500 five-dollar contributions from city residents. If successful, they would qualify for a lump-sum grant of either $200,000 for mayoral candidates or $150,000 for auditor and commissioner candidates for the primary, with additional funds if they advanced to the general election. Further, publicly financed candidates would also be eligible for supplemental funds if a non-participating candidate outspent them. Partially as a result of two high-profile scandals involving misuse of funds and forged signatures, voters repealed the program in 2010 by a narrow margin. In 2017, Portland commissioners approved a new public financing system, similar to that of New York City, which provides a 6-to-1 match on the first $50 of a qualifying contribution. Given the current jurisprudence on campaign finance, what is the best way to structure a publicly financed campaign system to reduce the influence of narrow, moneyed interests and promote more civic engagement? Seattle’s experiment with Democracy Vouchers provides an innovative approach to this challenge. In November 2015, Seattle voters passed the citizen-led initiative known as “Honest Elections Seattle” (I-122). Under this new system, developed under the leadership of Alan Durning of Sightline Institute, a Northwest sustainability think-tank, registered voters in Seattle receive four $25 Democracy Vouchers by mail. They can then distribute them to one or more qualified candidates as they choose. To qualify, candidates must collect contributions from between 150 and 400 residents of at least $10 but no more than $250. In the 2017 primary and general elections, the only positions for which vouchers could be used were for city council and city attorney. In the 2021 election and beyond, vouchers will also be used in the mayoral race. To finance the system, voters also approved a property tax of $3 million per year from 2016 through 2025. The Democracy Voucher Program costs the average homeowner about $11 per year. In a 2017 study published by the Washington state-based Win/Win Network and Every Voice, a national advocacy group, Democracy Vouchers had the desired effect of democratizing political giving. At least 25,000 Seattle residents participated as campaign donors in the 2017 municipal elections, including 18,000 through Democracy Vouchers. That is more than twice the roughly 8,200 people who donated to candidates in 2013. Further, Democracy Vouchers appear to have increased political giving by younger people, lower-income people, women and people of color, based on data compared to past elections. About 84 percent of donors were new donors who had not donated in 2013 or 2015. Of these, 71 percent donated Democracy Vouchers. Support for I-122 came from a variety of nonprofit and philanthropic sources. Major contributors to the campaign include: Every Voice, which provided $391,000; Washington Communication Action Network, which contributed $352,000; Sean Eldridge, a New York philanthropist and LGBT activist, who gave $200,000; and Win/Win Action, which gave $69,000. Public Citizen Foundation in Washington, DC, contributed $250. More generally, funders concerned about the negative effects of money in politics have played a significant role in shaping campaign finance reform. Established in 2010, the Piper Fund is a donor collaborative based in Amherst, MA, focused mostly on advancing publicly financed campaigns and reshaping current jurisprudence. The Piper Fund granted $200,000 to Washington Communication Action Network to support I-122 for grassroots activists to have a seat on the campaign steering committee. Measures to improve the public financing of elections, such as through democracy vouchers, can limit the distorting effect of money in political campaigns and increase political participation from parts of the public that are often less visible in politics. Major efforts often require support from a variety of sources. Each philanthropic contribution can be leveraged through strong collective commitment to an issue, including through funding collaboratives. A fair and impartial judiciary provides a check on the other branches of government and is necessary to ensure equality under the law. However, the process of judicial selection has a tremendous impact on judges’ ability to function independent of political influence. In the Northwest, most states directly elect judges, a practice consistent with other Progressive Era reforms like the ballot initiative and referendum processes. From 1940 to 1994, 23 states eliminated judicial elections and implemented an appointment or merit selection process. As more recent reforms efforts have faltered, the amount of money in judicial campaigns has exploded. From 2000 to 2009, state supreme court candidates raised $206.4 million nationally, more than double the $83.3 million spent in the prior decade. This does not even include independent expenditures, which can be extremely difficult to track. How should judges be selected to ensure they are highly qualified and independent from political pressure? Though there is no perfect system, the history of reform in Wyoming illustrates the role of advocacy in ensuring fair courts. At the beginning of Wyoming’s statehood in 1890, voters directly elected state judges to either six- or eight-year terms. If there was a vacancy before a term expired, the governor made an appointment. In 1971, the American Judicature Society launched a reform campaign in the Equality State. Then-State Representative Alan Simpson introduced a constitutional amendment to replace the popular election of judges with a merit selection system. The legislature approved the resolution on February 28, 1971, and voters ratified the amendment the following year. Wyoming’s form of merit selection, commonly known as the “Missouri Plan,” named after the first state to adopt the model, has several components. First, there is the Judicial Nominating Commission, made up of three attorneys elected by the Wyoming State Bar and three non-attorneys appointed by the governor. The chief justice presides but votes only when agreement cannot be reached. To be considered for appointment, attorneys must submit a letter of interest, a detailed application, a writing sample and references to the commission. Political affiliation is not requested. The commission offers the governor three candidates from which to choose. If the governor should refuse all three, the chief justice then makes the selection. The second component is the retention election. After a judge serves one year of their term, they must stand for an election in which voters decide if the judge should be retained to serve the remainder of the term. This is a significant contrast to a contested election with two or more candidates. At the end of the term, if a judge wishes to continue their service, they will again face a retention election. In order to provide meaningful information to voters, all members of the Wyoming State Bar are polled about each judge’s performance and whether they should be retained. The results of the poll are published online and in several print publications. The most obvious impact of the merit selection reform is the lack of money in judicial retention elections. Between 2008 and 2016, there were eight retention elections for state supreme court justice in Wyoming; not a single dollar was reported as raised in any of the races. In contrast, in the neighboring states of Idaho and Montana, which do not have retention elections, judicial campaign contributions over the same period of time were approximately one and two million dollars, respectively. Source: FollowTheMoney.org and United States Census Bureau. The presence of money in judicial campaigns is one important, but limited method of assessing the independence of the judicial branch. Another way is to look at the judiciary’s willingness to keep the other branches in check, given one-party dominance in the state. From the mid-1990s to the early 2000s, the Wyoming Supreme Court issued a series of decisions that the legislature was not meeting its constitutional requirement of funding public education. Frustrated by these rulings, the majority of legislators voted in favor of a constitutional amendment to weaken the merit selection system, giving more control to the governor and the legislature. Lacking the supermajority required for a referral to the ballot, the resolution ultimately failed. Judicial selection reform is one of the most intentional ways of strengthening democracy, yet foundations have played a limited role. The now-defunct American Judicature Society (AJS), a bipartisan advocate for effective judicial practices, had over its more than 100-year history relied primarily on membership contributions from judges, lawyers and individuals concerned about judicial fairness. AJS also attempted to ask judges for cy pres funds, or monies in class action lawsuits where not all injured parties can be identified. In 2011 and 2012, the Foundation to Promote Open Society contributed $350,000 to the organization. However, with a declining membership base and no other foundation support, AJS closed down in 2014. A sister organization, Justice at Stake, whose campaign received a two-million-dollar grant from the Bill & Melinda Gates Foundation in 2012, also closed recently due to lack of funding. The primary movement in philanthropy to support an independent judiciary is the Piper Fund. This funder collaborative housed at the Proteus Fund makes grants to state-based groups, with a very small portion coming to the Northwest region. Merit selection in state judicial elections can improve the judicial system's independence, which is necessary to a strong democracy. Not enough philanthropies have responded to the need for proactive reforms in judicial elections.